Leeds United, despite an unpredictable run in recent weeks, have regained the top of the table spot once more but must bring in some consistency in their display. The influence of Marcelo Bielsa has certainly been reflected in their game, but the iconic Argentine requires reinforcements and recruitment for the future. El Loco, one of the pioneers of modern-day football, is hailed for his tactical masterclass and youth development which he has already showcased at Elland Road banking on several homegrown prodigies in crucial times. The Whites, meanwhile, are rumoured to be making a move for 18-year-old Irishman Ali Reghba who has made significant strides of late at Bohemians scoring a brace against St Patrick’s Athletic on his senior debut back in September. 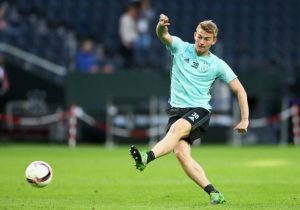 The teenage sensation has exhibited his excellence in front of goal versus Midtjylland in their latest UEFA Youth League tie for Bohs U19s and also notched the winner in last week’s SSE Airtricity U19 League title defence against arch-rivals Shamrock Rovers at the Tallaght Stadium. His rise has caught the eyes of plenty of esteemed English outfits with Middlesbrough currently the frontrunners having called him for three weeks trial that is set to be his second stint with the Championship side. The Whites, one of Boro’s prime promotion rivals, must step up the chase now in order to acquire the youngster under the nose of their Yorkshire rivals. Reghba has a great goal-poaching instinct as well as the sense of positioning required to flourish as a targetman. A move to Leeds would be more beneficial for the youngster concerning senior minutes that can be achieved under Bielsa sooner than anywhere else. The 63-year-old veteran has encouraged and promoted rookies throughout his glorious managerial realm, and the flexibility allowed many to become world beaters under his tutelage. But the Ireland U19 striker needs to adapt his philosophy, vision and tactical awareness to stake a claim for first-team football similar to the likes of Tyler Roberts, Jack Clarke and Jamie Shackleton who all are still in their teenage years. Leeds, however, had banked on little-known prodigies in recent years who failed to make an impact in their attacking third. Caleb Ekuban, Paweł Cibicki, Jay-Roy Grot and Hadi Sacko are the recent examples of players who had their opportunities but could not convince the gaffer during pre-season. But the attributes of Reghba suit the traits of Championship football which is known for its robustness, aggressive nature as well as physicality and the experience in Ireland should help him to adjust to the new surroundings, particularly in West Yorkshire! 4-2-3-1 Fulham Predicted Lineup Vs Reading: Unchanged Side For The Cottagers? Manchester City Plotting A Move For Highly Rated Championship Winger: Do They Really Need Him? Tottenham Hotspur Plotting Summer Move For 20 Y/O Championship Midfielder: Where Can He Fit In? Aston Villa Keep Their Tabs On 30 Y/O Leicester City Forward: Right Choice For Steve Bruce?